Yallammagudda Temple situated in the district has numerous visitors from Karnataka, Andhra Pradesh & Maharashtra. Yellamma is worshiped as the Goddess of the fallen, in the Hindu pantheon. Legends say that Yellamma is the incarnation of Kali, who on one hand symbolizes the death of ego, and on the other hand is the mother who is compassionate about her children. Saundatti is popular for the wonderful and ancient temple dedicated to Goddesss Renuka also called as Yellamma. The temple is situated on Yellammagudda, which is about distance of 5 Km from Saundatti. 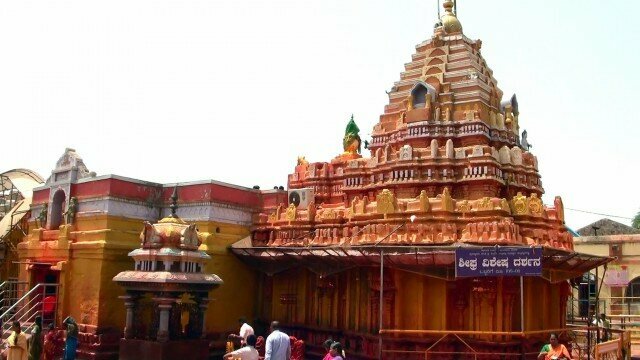 Saundatti Yellamma Temple is built in the Chalukyan and Rashtrakuta Style of architecture and the Carvings indicate the Jain architecture.Saundatti Yellamma Temple houses multiple shrines dedicated to Lord Ganesha, Lord Mallikarjun, Parshuram, Eknath, Siddeshwar in its premises. Badrinath – Ancient Temples of India 2009 October. Copyright 2019 © Hindu Channel All rights reserved.